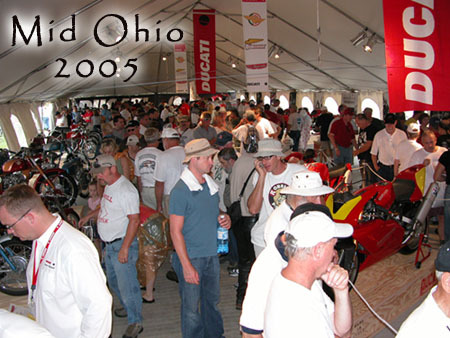 Ducati was the mark for the Mid Ohio Vintage Motorcycle Days for 2005. Special thanks for Ducati North America, Rich Lambrechts, Roger Harrison and Vicky Smith for an amazing job organizing more than 70 DUCATI bikes to display in the museo at Mid Ohio. It was AMAZING! Below are photos from the event that Steve Allen took, click on the thumbnails for larger images from the weekend. There was some vintage racing going on here - I escaped to the far side of the track to take a few photos. As you can see, it was pouring down rain with puddles and wide waterways developing across the track - yuck! Below are some more photos of racebikes around the pit area. Yep that is Phil Hitchcock in Rich's garage. Steve Craven came over and raced a couple of his bikes. Below you will see John Porter, Reno Leoni and Eng Gianluigi Mengoli giving a very nice history report on Bologna, Ducati and other interesting facts.